ABBOTT PARK, Ill., May 9, 2017 /PRNewswire/ -- Abbott (NYSE: ABT) today announced CE Mark of the TactiCath™ Contact Force Ablation Catheter, Sensor Enabled™, developed to make it easier for physicians to more effectively treat atrial fibrillation (AF), a condition in which the upper chambers of the heart beat too fast. When integrated with Abbott's EnSite Precision™ cardiac mapping system, physicians are able to utilize dual impedance and magnetic technologies to help more precisely model the heart. This integrated system also helps physicians determine where to apply optimal contact force (pressure) when creating a lesion during a cardiac ablation to correct a heart rhythm abnormality. The Sensor Enabled technology allows physicians to create a more detailed heart model during ablation procedures than a catheter without a sensor. The CE Mark is the latest in a line of new approvals within the company's leading atrial fibrillation portfolio. "The TactiCath™ Contact Force Ablation Catheter, Sensor Enabled™ along with the EnSite Precision™ cardiac mapping system create a powerful combination for more precisely treating patients with cardiac arrhythmias," said Martin Lowe, M.D., clinical director of cardiac electrophysiology at Bart's Heart Centre at St. Bartholomew's Hospital in London. "Feeling confident in the accuracy of the contact force reading allows me to target the optimal pressure for creating effective and safe lesions." The TactiCath™ Contact Force Ablation Catheter, Sensor Enabled™, is a significant update to the TactiCath™ Contact Force Catheter family – which is the most-studied Contact Force ablation catheter platform to date and has unmatched clinical evidence based on number of completed prospective, protocol driven, industry-sponsored, registered studies on Contact Force technology. The clinical evidence show use of optimal Contact Force guided AF ablation with the TactiCath™ Quartz catheter resulted in clinical success in 85.5% of patients and fewer post-ablation clinical events, translating to a 15% reduction in post-ablation management costs ($3,402 savings per patient) in the year after ablation vs. patients treated with a non-contact force ablation catheter. 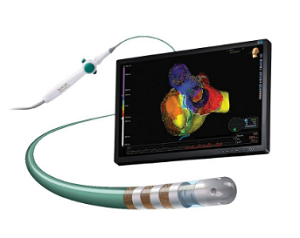 The magnetic sensor of the TactiCath™ Contact Force Ablation Catheter, Sensor Enabled™ integrates with the Abbott EnSite Precision™ cardiac mapping system, providing the ability to collect both magnetic and impedance (resistance) data so physicians can create more life-like models of the heart. It also uses the Abbott FlexAbility™ catheter platform's advanced ergonomic handle-shaft combination, which is designed for reach, maneuverability and 1:1 torque. When utilized with the EnSite Precision™ cardiac mapping system, the TactiCath™ Contact Force Ablation Catheter, Sensor Enabled™ can improve workflow efficiency in the lab. The system enables automated guidance of lesion marking, verification of the ablation catheter stability, the ability to automatically record the precise location of the catheter tip during radiofrequency energy application, the capability to add mapping points based on Contact Force and the ability to review and identify any potential gaps by viewing specific lesions from the display list. "The goal in developing the TactiCath™ Contact Force Ablation Catheter, Sensor Enabled™ was to provide the most innovative solution for treating atrial fibrillation and lead the way in clinical outcomes for patients with cardiac arrhythmias – even during long and complex ablation procedures," said Srijoy Mahapatra, M.D., FHRS, medical director of Abbott's electrophysiology business. "Integration with the EnSite Precision™ cardiac mapping system provides an unprecedented opportunity to help patients suffering with atrial fibrillation." Currently the TactiCath™ Contact Force Ablation Catheter, Sensor Enabled™ is available in select markets in Europe, with full market release expected in the third quarter. Abbott is pursuing approval in the U.S.